The NYBL had its first session in Districts Heights, MD and Basketball Spotlight was in the building for the action. Here’s our second look at the 7th Grade Division top performers. Mitchell’s recent growth in size and his play this weekend had to put him back into the #1 Player in the class talk. Yes, the silky smooth wing shot up a few inches and used his to punish defenders. Against Team Rio he damaged the middle of their defense with runners and step through moves. 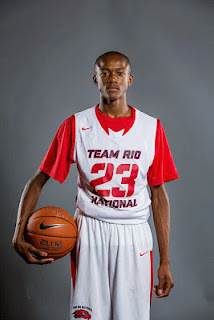 He had his best outings against top squads Rio National and Team Takeover while helping his crew to a perfect weekend. Lewis held up his national rep while leading the troops to a 4-1 weekend. He did most of his damage after catching the rock at the free throw line and attacking. He also was simply too much to handle in transition. On defense he was intercepting passes like shut down corner and swatting shots. His shot blocking ability is remarkable for his size. In terms of developing I think he should work on changing speeds when making moves and using his left hand a little more often. Jones needed a couple of games to get acclimated with his new squad and the speed of this type of competition. But once the lad got his feet under him he was back to his Player Of The Year mode. He was very dominant in the post versus George Hill and Ohio Hoopsters. In case you forgot he can quickly turn in to lay up making machine. It was good to see him in action once again. The fullback built point guard has the skills and savvy for the position but also uses his power to dominate on this level. On offense he carries defenders to wherever he wants on the floor before penetrating and making things happen. On defense he can get into ball handlers and use his strength to navigate their movement. He’s a physical as they come. In terms of production Sarnor might have been the most consistent Rio player of the weekend. He brought his A- game against All Ohio because he was strong enough to play their physical game. He finished through contact, battled for put -backs and stepped out for jumpers. His best gift is his attacking ability and getting to the rim. Antoine has awoken and turned the corner. This weekend not only was he aggressive on the offensive end but he was an intimidating force on defense. He blacked several shots and was a demon in the passing lanes. In transition he was determined to finish even if he had to climb into the chest of the shot blockers. I love how his game is progressing. This weekend the coach had Mack on the lower block and he feasted. His turn around and quick spend moves are a compliment of his footwork and his touch seems natural. Now he just has to work on setting up camp deeper. On occasion he catches the pass a little too far from the basket which allows the double team to get there before he makes his move. The closer he sets up to the cup the more he will punish the defense. There’s nothing better than a confident shooter when he’s rolling and Chris had a few on these moments this weekend. In transition he set up in the corner and made the defense pay. He also showed good body control when finishing off the plays and avoiding shot blockers. Brooks had a serious growth spurt and stands about 6’4 right now. Now this makes this kid a real dangerous prospect down the road because of his unique skill set. If his game continues to develop and he keeps growing we might have a smaller version of Jayson Tatum on our hands. Gary has sprouted up since the last time we saw him and with his size, strength and athleticism he is a man amongst boys in the painted area. He led his team to a signature win against the number two team in the country Texas Express with a 30 point outburst and close to 20 rebounds. We also saw him catch a two-handed alley-oop dunk on the break in one of the Hornets earlier games. With Juwan controlling the middle the Hornets finished the NYBL Session #1 on a high and are back in the national spotlight after under performing at AAU Nationals last year. Hinton has been a national name for the last few years and one of the top Post players in the class leading his team to a #5 national finish last year. Making a move to a new club this year his results are still similar as he led the Reach Higher Kings to a good start in Session #1 of the NYBL. Hinton has added to his game as he is handling the ball a little bit more and shooting some jump shots adding to his already physical back to the basket game. Chris put up some big scoring games this past weekend along with controlling the backboards. Sydney is fresh new face to the elite travel basketball scene. This kid is oozing with potential and he hasn’t even cracked the surface. Standing at 6”4” this left handed man child dominates the paint. He has a nice touch around the basket and he doesn’t stray away from his strengths which makes him that much better. Keep an eye on “Syd Viscous” as we believe his stock will continue to rise. Gordan is a nice complement to Jerimiah Francis. He has nice size and strength for a guard. Andre has a good feel for the game and plays at his own pace. He can attack the basket or knock down the long trey ball as he has nice form and rotation on his shot. He is a great addition to help this All Ohio team defend their NYBL championship. This Canadian player could have been the best prospect in the building. Standing at 6’4” he is a major athlete with great length. This lefty has great guard skills which leads me to believe he is in the gym all the time. He has a nice jump shot with good rotation with range to the 3 point line. His handle is good and he can attack the basket from all points on the floor. If needed he can also be effective in the paint in this age group but long term he will earn his keep on the perimeter.